GRDB Cowan Street, Kingston, Georgetown. “They haven’t shipped for the year,” she told Demerara Waves Online News, adding that she has written the Jamaican authorities “to investigate what is happening”. “Nobody has informed us of anything and we have just seen this thing in the news,” Peters added. Peters expected the Jamaica Bureau of Standards to contact the GRDB because “we have a relationship” although there have been no major complaints of poor quality rice in recent times. Peters said officials at her semi-autonomous regulatory agency were “shocked” by news that the Food Storage and Prevention of Infestation Division (FSPID), in the Jamaica Ministry of Industry, Commerce, Agriculture and Fisheries (MICAF) confiscated 1,575 bags of rice due to high microbial content. “I have no information; just what I’m seeing in the news so they will have to give me details if they have found such a thing,” the GRDB Deputy General Manager added. 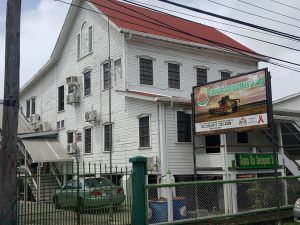 The rice, valued at approximately $4.6 million, was allegedly imported from Guyana by a large Jamaican chain distributor, and was found to have signs of mould growth, clumping discolouration and wetting, and as a result was detained by a food storage inspector. The Division advised that a statutory detention notice was subsequently placed on the rice and samples collected were submitted to the FSPID’s Microbiology Laboratory for testing. The results revealed that the rice had microbial levels above the accepted limits and as such was deemed not suitable for human consumption and was condemned. The seizure is said to be the first for the year. However, the Jamaica Observer newspaper did not say when the rice was shipped or arrived on the island.